In July 2013 I found out I was pregnant for the first time with my husband of one year. At first I was nervous as this was unplanned, but as I began dreaming of my little baby I grew ecstatic. 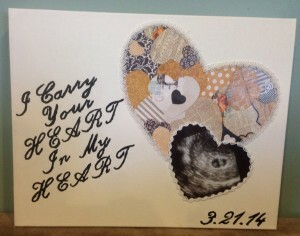 My husband and I went to the doctor at 6 weeks and saw my baby’s adorable heartbeat. I cried years of joy. I found out my due date – March 21 (2014) – and my mom told me that was my due date as well. It was fate! Two weeks later I began bleeding and the doctor could no longer fun my precious child’s heartbeat. I have never cried harder in my life, and I continue to mourn my loss. I have since been pregnant twice and both of these have ended in miscarriage as well. I think about my 3 sweet angels everyday, and hope for a happy ending. This year I will create a piece of art with my baby’s ultrasound and share it on Facebook and Instagram. I want to continue to remember my baby and also I want to be vocal about miscarriages so that others don’t feel as alone as I have.